2015 Health Justice Media Awards focus on a very compelling theme: Health Justice Under Gender Lens. With Millennium Development Goals (MDGs) expiring this year, and our governments adopting the Global Goals for Sustainable Development for 2030 in the UN General Assembly in September 2015, it is important for all of us to understand what these Global Goals for 2030 mean for us in our local contexts. For instance, what does it mean to achieve gender equality by 2030 on the ground? Where are we in terms of sexual and reproductive health and rights (SRHR) and what should the trajectory look like to progress towards achieving these 2030 goals locally? 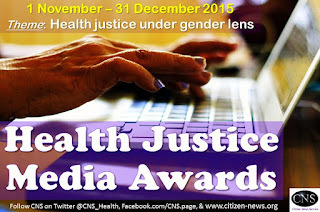 Health Justice Media Awards 2015 will be given to 1 print/ online/ TV/ radio journalist from each of the following states: UP, AP/ Telengana, Tamil Nadu, Karnataka, Gujarat, Jharkhand and West Bengal. Journalists who write for print or online media or produce broadcasts for radio or TV, and live in states of Gujarat, Jharkhand, West Bengal, Uttar Pradesh, Andhra Pradesh, Telengana, Tamil Nadu and Karnataka are welcome to apply. They need to submit at least 2 news feature stories (maximum of 3) on the theme of 'What the Global Goals 2030 mean for sexual and reproductive health in your state's context', published/ broadcasted between 1st November 2015 to 15th February 2016 in English, Telugu, Tamil, Kannada, Bengali, Hindi, Urdu, or Gujarati. Deadline for submission is 15th February 2016. Simple! Click here to register! Or fill up the form below. Send at least 2 news stories or broadcasts on above mentioned theme which have been published between 1st November 2015 - 15th February 2016. Email the links at fellows@citizen-news.org or call +91-983-999-0966 for any further assistance. Thanks! Note: Deadline for sending completed registrations along with links to 2-3 published news feature articles on above-mentioned theme, is 15th February 2016.